"I believe music is a birthright. My hope is more and more people will come together to sing, dance, and make music informally, giving the gift of music and community to all children and grown-ups too!" Located in Chicago, Illinois, Marsha's Music has been serving the local community for 17 years! 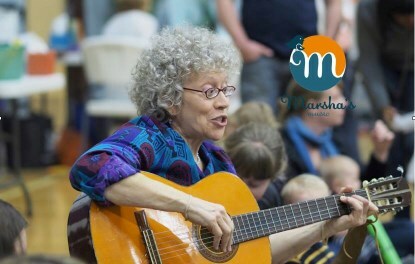 Our founder, Marsha Melsheimer, developed her love of music early in life, growing up in a family of six kids, surrounded by singing and musical accompaniment. With a classical music training and a passion for early childhood education as a preschool teacher, she decided to introduce Music Together® program to the Hyde Park community in 2001. The business has grown to locations throughout Chicago, adding accomplished teachers and expanding its musical offerings. Our focus is bringing The Joy of Family Music® making to all children birth through age five and the grown-ups that love them in our Music Together® Mixed Age classes. The fun and learning continues for children up to eight years old in our Music Together Rhythm Kids™ program. We also bring the Music Together® curriculum and fun to preschools and events in the Chicago area.